The caves around the town of Huautla de Jiménez in the Sierra Mazatec were first visited by American cavers during the 1960s. Since then many of the caves have been connected to create a system known as Sistema Huautla. With a length of 75km and a depth of 1560m Sistema Huautla is the western hemisphere’s deepest cave. The water flowing into Sistema Huautla has been followed downstream as far as sump 9 in Sotano San Agustin where it disappears until it re-emerges in the Santo Domingo Canyon in the completely flooded ‘Huautla Resurgence’ cave. Should the ~10 km gap between these two cave be closed there is the potential for the system to have a depth range of over 1,750 meters vertical, with passage length in excess of 100 km. The Huautla resurgence has been visited by divers in 1995, 2001 and 2016, with each expedition diving further into the mountain. In 2016 the dive team surfaced at the end of sump 2 and mapped over 900m of large dry passage heading north towards Sistema Huautla. 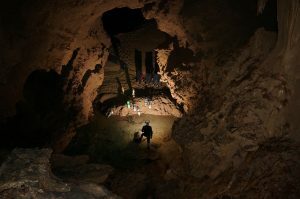 2) Conduct a reconnaissance trip to the Cueva de la Peña Colorada in preparation for a potential international expedition in 2018. A seven person team with people from the United Kingdom (UK), United States of America (USA), Mexico and Australia was put together for the expedition. The expedition was in the field over a four week period from 19th March to 15th April, although a huge amount of work was done prior to this to make the expedition possible. Vast amounts of equipment are required for a diving trip of this nature, and the expedition was fortunate to have a team member (Zeb Lilly) with a vehicle large enough to move it all from the USA to Mexico. Zeb also undertook the job of filling 30+ cylinders with the gases required for long range diving. On March 15th Andreas Klocker, Gilly Ellor and Ernest Garza left the USA and drove two trucks through Mexico on an 1500 mile journey to the small village of Santa Ana Cuahtémoc, a journey taking them three days. Other expedition members flew into Mexico city and made the 6 hour bus journey to Teotitlan de Flores before meeting Andreas and the others and heading up into the mountains to Santa Ana. Permission to operate in the area was required from 3 different groups of people for the expedition: The municipality of San Miguel Huautepec, the local village of Santa Ana Cuahtémoc, and the local farmers whose track was used to get down to the canyon each day. The same house as in 2016 was rented for a 4-week period from a family in the village of Santa Ana Cuahtémoc. The village shop was used for local purchasing of food, with small amounts of food being purchased in Teotitlan de Fores Magón prior to the group heading up the mountain. The expedition leader also managed to arrange for a caver who lives in Mexico City, Alejandra Susana Mendoza (‘Alex’) to return as the expedition translator and cook. Alex once again proved to be a great asset to the team with her cooking, translation and diplomacy skills. From the village the journey to the cave takes around 2 hours, a 1-hour drive along dirt roads down to the canyon followed by a 45-minute hike along the river banks, involving 3 river crossings and lots of boulder hopping. This last section was typically done carrying a pack of around 20 kg, as every piece of dive gear had to be carried to the cave by hand. To reach the dry passage found in 2016 it is necessary to traverse a distance of 1.6 km underwater reaching a maximum depth of 65 m. To cover these sorts of distances repeatedly rebreathers are the most efficient option as only small oxygen cylinders and CO2 absorbent needs to be replaced after each dive. However for safety reasons all divers carry large ‘bailout’ cylinders, and 6 cylinders were additionally staged in the cave at key locations. In 2016 all the divers traversed the sump entirely by swimming, resulting in significant decompression obligations with dive times in excess of 3 or 4 hours. This year we were fortunate to be loaned two Diver Propulsion Vehicles (DPVs), or ‘scooters’. The two ‘Minnus’ scooters manufactured by Silent Submersion run on high capacity lithium batteries and were light enough to be carried to the cave and over the waterfall between sumps 1&2. At the same time they had capacity to make multiple trips through the sump without needing to come out to be recharged. The scooters significantly reduced the dive time and decompression obligation. Finally, in order to establish an advance camp beyond the sump, special containers capable of withstanding the pressure of water at depth were manufactured. These ‘dry tubes’ were made and tested in the UK and used to get camping equipment through the long diving sections. Between 21st March and 25th March the team carried out a number of setup dives which included installing new line in sump 1 and 2 and staging various bailout cylinders. Finally on 26th March the team was ready for the first camping trip. The first camping team was comprised of Chris Jewell, Andreas Klocher and Max Fisher. The team began by establishing the fundamentals required to stay in the cave, e.g. preparing sleeping areas, kit storage areas, cooking areas and toilet areas. Following this preparation the team climbed up into a passage above the sump pool which has been noted, but not explored, in 2016. Large ongoing fossil passage was entered trending South East and which was thought to be the original continuation of the large passage which the divers surface in. In sump 2, once the large underwater chamber discovered in 2001 is left behind, the main flow now seems to be in immature passage in comparison. The team quickly reached a steep muddy climb overlooking two sump pools. This proved to be the surface of pool found in 2001 where no easy way out of the water was noted. A short way back towards the camp another passage was explored of much smaller nature. This contained some very delicate crystal formations. These passages were surveyed and photographed before retiring to camp for the night at around 11pm. After breakfast the team surveyed a small low passage which nearly forms a loop back to the sump pool. This passage must take water when the system begins to flood but no flow was noted at this time. After discussion on how to continue, two of team re-entered the water to attempt to locate an underwater continuation of the passage. A search to –38 m was conducted with very little success. One small lead at a depth of 11 m was left due to the line reel jamming. The team then moved focus to the ‘above water’ end of the cave where a large calcite and flowstone choke blocks the river. This area of the cave was searched for some time to attempt to locate a bypass to the flowstone restriction but none could be found. A high level passage was searched and a climb up 50 m yielded uncharted territory. A high level fossil passage was entered at a T junction. Initially this was explored to the South East where pristine white flow stones and formations adorned the walls. Dead scorpions were noted encrusted into the calcite where the team was stopped by a pitch. A return to camp was made to collect provisions and survey equipment before further exploration and subsequent survey of this area was completed. Several leads were noted and marked for the second camp team to continue exploration from. The furthest point reached into the mountain (trending Northwest) was thought to be beyond the obstruction encountered below but no way down could found. A return to camp was made at around 11pm. The next morning preparations to leave the cave were made an the three divers had an uneventful dive out. 900m of passage was explored and surveyed during camp 1, with many photographs captured to document the cave. In lieu of the dead scorpions and lack of water in the many dry gour pools found this section of the cave, it has been named ‘The Dead Sea’. The second camp had an initial false start when Connor Roe suffered a rebreather flood and had to abort his dive in sump 1. The other divers then exited with Connor and the camping trip was postponed for a day. The following day a reduced team of Zeb Lilly and Matt Vinzant went back into the water and completed the dive through to camp. The early evening was spent following up the leads left by Team 1. This involved a number of tight and precarious squeezes leading to several large chambers trending towards the north. Around midnight the team had surveyed everything they explored and returned to camp with a list of potential leads. The following day the team of two returned to investigate the remaining leads. This involved a great deal of scrambling around in high level passages and surveying in confusing maze like tunnels. However by that evening all of these leads were exhausted. On the morning of the third day Zeb and Matt decided it was worth diving in Sump 3 located upstream from the calcite dam. 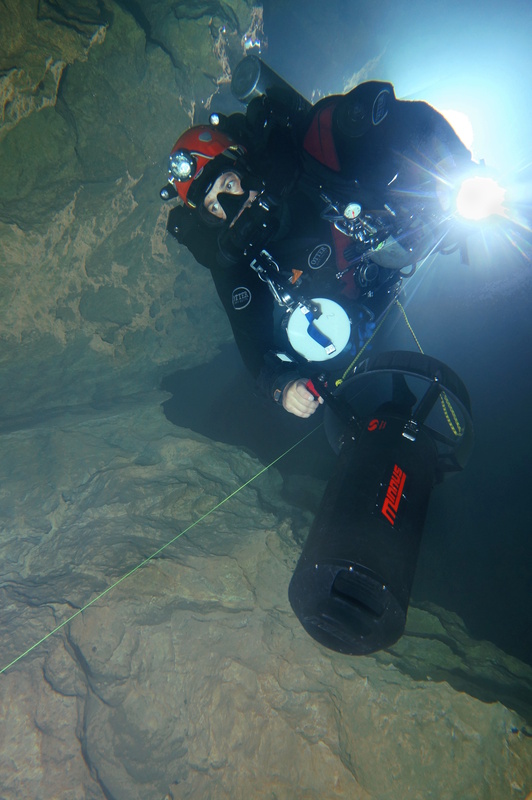 The duo used minimal dive gear to investigate the lead and discovered a low gravel restriction at a depth of 6 m worth a second look. In total the second camping team mapped 600 m of new cave passage. After a good night’s sleep the team exited the cave to be met by the support team on the surface. 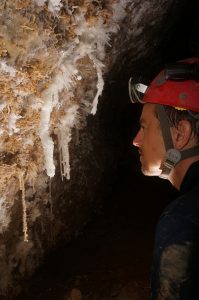 During the second camp the team concluded that the best lead was now the small sump near the end of the cave next to the large calcite choke when the main stream emerges. Rather than mount a full camping trip the group was now comfortable with the idea of tackling this in a single long day. A team of three prepared their equipment but when Zeb Lilly was unable to equalise his ears, Connor Roe and Matt Vinzant dived as a pair. Sump three was very small and low preventing the use of the backmounted rebreathers used in the rest of the cave. Consequently Connor dived sump three using standard side-mount equipment a wetsuit and two 40 cuft cylinders which were carried in from the surface specially for the purpose. After nearly an hour in the water involving some underwater digging a distance of 5 m was achieved before the cave became too tight and the dive had to be abandoned. By the end of the expedition all of the significant leads and open passages had been exhausted which suggests that a human sized route from Sistema Huautla to the resurgence is unlikely to be found. This team currently believes that the majority of the main water flow comes through the calcite restriction and that this barrier may be more than a localised obstruction. However there are still questions to be answered in the resurgence and surrounding area. Where does the water which flows from this calcite dam join sump 2 and does all the water disappearing in sump 9 in San Agustin exit from the resurgence or are there other caves in the Santo Domingo Canyon? This expedition successfully mounted two underground camps beyond significant length sumps in a remote part of Mexico. The challenges of a trip like this are as much logistical as physical and due to the quality of the team assembled all dives were completed in a safe and efficient manner. In total 1.5 kilometres of cave was found, taking the total cave length to 3.8 kilometres of cave passage were mapped and the experience gained by the team will be invaluable as we now move our focus towards Pena Colorada in 2018.